Right-click the cell where you want the hyperlinked task to appear. The Insert Hyperlink dialog box appears, as shown. In the Text to Display box, type the text that you want to appear for the hyperlink. Ensure that this text clearly states what information is being summarized. 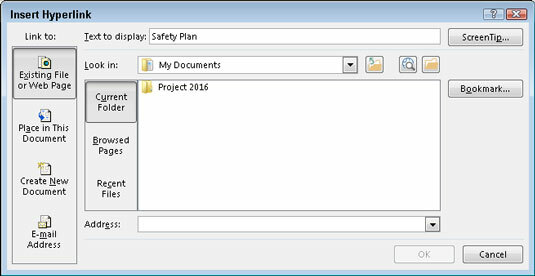 In this case, you’re linking the Safety Plan to a task in the project. In the Link To area, click the Existing File or Web Page icon. You can link to a document of any type or to a web page. In the Look In list, locate and select the file to which you want to insert a hyperlink. The link text is inserted, and a hyperlink symbol appears in the Indicator field. You can simply click that link symbol to open the linked file.